Last Wednesday, the Fire played a friendly (exhibition game) vs. Wisla Krakow, a polish team. The match was pretty much horrible as both sides played their reserves, and neither side could keep possession of the ball long enough to come up with any viable scoring opportunities. The match ended in a disappointing nil-nil draw (0-0 tie). I sat with section 8 (the crowd of rowdy die-hard fire fans who sing and chant the whole game giving all the Fire game's some much needed ambiance) largely because I didn't want to be surrounded by opposing fans, who turned out in droves to watch their squad take on the Fire, the mighty, mighty Fire. Pedro Gomez' sideline report on ESPN Thursday Night Soccer - "He is extremely frustrated with this situation. He didn't come to this country to sit on the bench and be away from his family. He would love for them to let him even go back to Columbia to play in his native country, but they're not doing that. He said he has been told by a member of the Fire's front office that they will not trade him to the Eastern Conference because they do not want to strengthen another team in their own conference. Obviously a lot of speculation has been about him being reunited with the former Fire coach, Juan Carlos Osorio in New York. Guys -"
Anyhow, Conde, one of the most talented players on the Fire, got the start against Wisla and singlehandedly kept their entire team from scoring... well with at least one assist from back-up goal keeper Nick Noble. 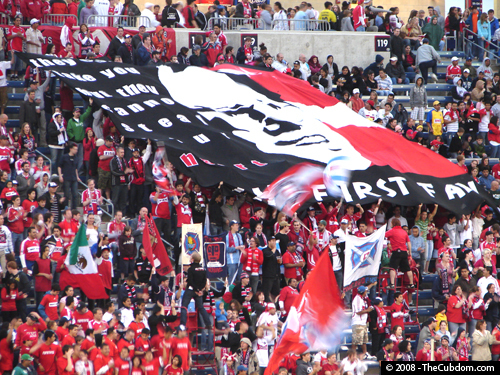 The back story on the Red Bulls game was especially interesting as the Red Bulls' new coach, Juan Carlos Osorio, is the Fire's old coach... and the Fire didn't really want him to leave... and Wilman Conde wanted to leave the Fire so he could follow the coach who he'd played for as far back as when Osorio was coaching in Columbia. Complicating matters even more is that there's another Fire player named Lider Marmol who would also rather be playing in New York for Osorio. All of this creates a tangled web of loyalties and hurt feelings, but one squad proved a slight bit better when the Fire absolutely destroyed New York on Sunday, 5-1. The Fire faced off against the Houston Dynamo last night at Toyota Park, and as usual, I was in attendance. 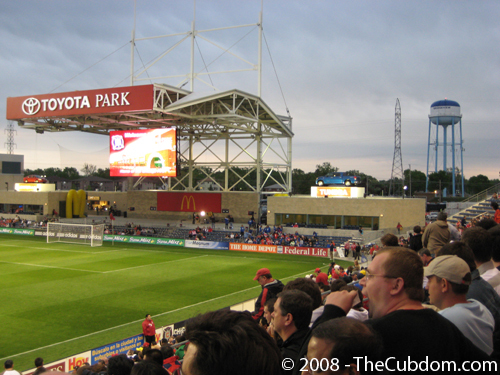 The weather yesterday afternoon was a beautiful 70 degrees and sunny, so Toyota Park was idyllic right before kickoff. Section 8 was in full throat and apparently decided it was a good time to honor Peter Wilt, I'm assuming they want him back as the team Presidency is currently vacant. On a side note, they were very loud last night and could be clearly heard, trumpet and all, at mid-field where I was sitting. The great weather, and my great mood wouldn't last long however. 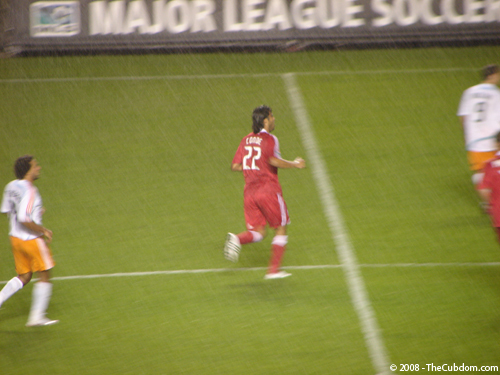 God soon began to pour water down from the heavens, which made the pitch wet. In the 17th minute, Ricardo Clark (Houston) had a great look from the top of the penalty area, as he approached the ball, I had fear flash before my eyes, but Chris Rolfe sacrificed his body and dove in front of the smash. With relief, I watched as the ball deflected high into the air, but John Busch was slipping on the turf and the ball bounced into the back of the net just out of reach of the best goalkeeper in MLS. 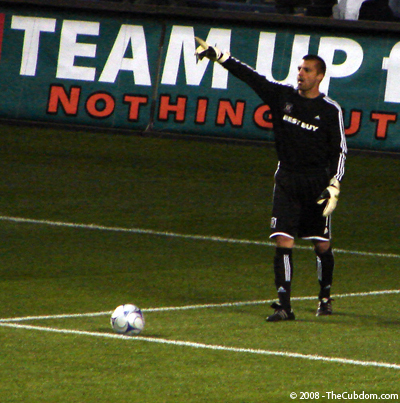 Jon Busch is the best goalkeeper in MLS. Later, in the 28th minute, someone fouled a Fire player (the details are irrelevant), and a free kick was awarded to the Fire. There's no reason to describe Cuauhtemoc Blanco's assist or Calen Carr's goal, because I happened to have caught it on video. Cuauhtemoc Blanco takes a free kick and Calen Carr heads it in. Toyota Park erupts in joy! In the second half, Wilman Conde was subbed in. I think it was only his second time seeing action this year... and you didn't believe me when I said it was pouring. Wilman Conde, playing in the rain. Anyhow, in the 84th minute, Conde fouled someone and the referee pulled him aside to lecture him, all the while allowing Houston to take the free kick. Surprise, surprise, with Conde out of position, the Dynamo scored, giving them the 2-1 victory. While I'm busy complaining about the referee, I've got to say, he was atrocious last night. Fran Spielman reports in the Sun-Times that the Cubs have reached an agreement with Tom Gramatis, the owner of the Ivy League Baseball Club (3637 N. Sheffield Ave), the Sheffield Baseball Club (3619 N. Sheffield Ave), and the Wrigley Field Rooftop Club (3617 N. Sheffield Ave). The new agreement seems to be fair. It exempts the Ivy League Baseball Club from the 17% revenue sharing agreement the other rooftops have in favor of a flat fee. This is because the Ivy League Baseball Club has a lower roof than the surrounding rooftops, so it's view was obstructed by the 2006 bleacher expansion. In return for the concession on the Ivy League club, Gramatis agreed to submit his new rooftops to the standard revenue sharing program. Here's a picture I took last month (below). 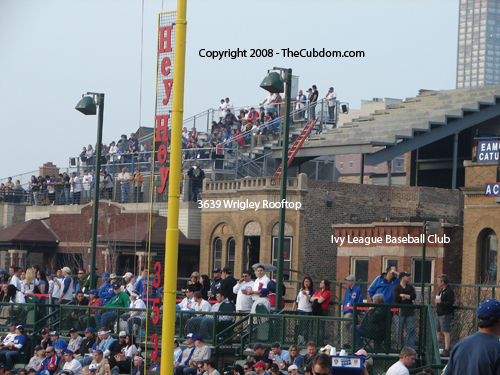 You can clearly see 3639 Wrigley Rooftop and the Ivy League Baseball Club are under construction. 3639 Wrigley Rooftop has a new hulking bleacher on top, but I'm not sure what the plan is to improve the view from the Ivy League Club. The other interesting nugget in the article is an estimate that the total revenues of all the rooftops are around $18 million, making the Cubs' take $3 million. 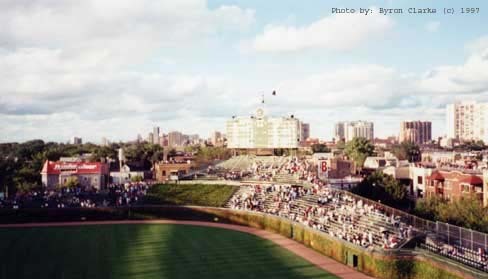 For more information on the Cubs Rooftops, check out the Wrigley Field Rooftop Directory. Deep in the Bowels of the Tribune Company, Sam Zell and a handful of Tribune Company executives are seated around a conference room table. Sam Zell: We took out too much debt to buy this blasted company. Everybody needs to come up with a way to make more money, pronto! Crane, Crane Kenney, how can the Cubs make more money? Crane Kenney: Well, we could sell naming rights to Wrigley Field. Zell: Out of the Box you numbskull! Kenney: Er... we could sell the stadium to the state. Just make a little contribution to the G-Rod campaign and maybe the state will pay more for the decrepit park than any other suitor. Zell: I like where you're going with this, Crane... but it's not good enough or quick enough! Kenney: Well, our best assets are Wrigley Field, followed by our flagpole legends (Ronny, Billy, Ernie, and Ryne). Shazaam! Let's have a legends day at Wrigley! Zell: Come on Crane, you're almost there... keep squeezin' that noggin' of yours. We already have a legends day virtually every single year. We already sell out every game, how could we possibly squeeze out more revenue? Kenney: An orgasmic look of bliss suddenly seizes him. We could have a legends game! Get all the guys out to play on the new turf. That'd sell like hot cakes. Zell: Scratches his beard in deep thought What would happen if Ernie broke his hip... that could be a PR disaster. No, we should keep the baseball playing to young folk. Kenney: Wait... I'm getting an idea here... We've got Ryne Sandberg managing in Peoria, he'd sell tickets! Let's just have the Chiefs play at Wrigley. Zell: That's what I'm talking about, Crane. Way back in the day, I used to publish my all-star votes periodically as a way to discuss the rest of the league. Now that all-star voting is available again this year, I think I'll do so again. For those stats inclined folks, please don't freak out. I haven't looked at anything to make my decisions. No, mostly these were influenced by watching baseball tonight and the sports page. • Derrek Lee may not get many votes over Albert Pujols, but Derrek is awesome and Albert's a Cardinal. • Chase Utley reminds me of Ryne Sandberg. How about a Ryan Theriot for Chase Utley deal. Darn, I wish Ed Wade was still in Philly. • Alex Rodriguez is the best player in baseball, and one of the greatest ever. David Wright probably ought to get the vote on the NL side, but he wears the wrong uniform, so Aramis Ramirez wins my vote. • I've always loved Pudge Rodriguez, even if he destroyed the Cubs in 2003, even if he might have done something bad that rhymes with airtroids. And of course, I had to vote for Geovany Soto. He had six RBI yesterday! • Ken Griffey Jr. deserves way more respect and fanfare than he gets. He's played clean throughout the steroid era, and he's on the doorstep of 600 homeruns. Ruth, Aaron, Mays, Griffey. • Ichiro! is still one of the most exciting players in all of MLB. His countryman Kozuke Fooky isn't too far behind. • It's really not fair that the All-Star game determines World Series home field advantage. The All-Star game is heavily tilted to the American League because of the undue influence of hitting in the All-Star game (Pitchers never hit), yet the AL teams all have an extra hitter. This is played out in the Baseball lines at Bodog. If I didn't like Big Papi so much, I would have abstained from voting for the DH. • I voted for only four Cubs. I wasn't too bad, was I? And Finally, I updated the Chicago Cubs Owner Review page to include the latest on Sam Zell, the Illinois Sports Facilities Administration, and the Cubs sale process.